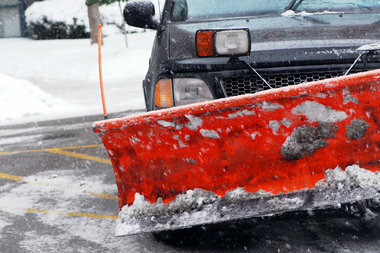 Ernest Lapointe, 38, was arrested after prosecutors said he stole a snowplow and crashed it into two parked cars. OLD TOWN — A Staten Island man was charged with drunk driving after he stole a snowplow in New Jersey then crashed it into two parked cars Sunday, prosecutors said. Ernest Lapointe, 38, stole a white Dodge Ram with a snowplow attached from a New Jersey man Sunday, according to court papers. Lapointe then drove the truck to Staten Island, where he crashed it into the front of a parked Jeep Cherokee and the back of a parked Cadillac SUV on Urbana Street around 6:44 p.m., court papers read. After the crash, Lapointe tried to flee from officers on foot but was eventually caught and arrested. Police said in court papers that Lapointe smelled of alcohol and was slurring his words when he was stopped. The arrest was first reported by the Staten Island Advance. Lapointe was charged with driving while intoxicated, criminal possession of stolen property, unauthorized use of a stolen vehicle and leaving the scene of the accident, the District Attorney's office said. ► An ex-con with a long rap sheet was caught shoplifting by a CVS employee who threatened to stab the worker with a syringe while claiming he had AIDS, prosecutors said. Frank Andolina, 47, was stuffing medicine into his backpack at the CVS at 250 Page Ave. on Jan. 21 around 5:00 p.m. when he was confronted by an employee, according to court papers. When the worker tried to stop Andolina, he held a needle in his hand and told the employee "Let me go, I have AIDS. I will f--king stab you," according to court papers. After a struggle with Andolina, the employee eventually recovered the merchandise, court papers read. Andolina was arrested Monday and charged with robbery at his arraignment, the Staten Island District Attorney's office said. He was ordered held on $10,000 bail and is due back in court on Friday, according to court records. Andolina has been arrested 47 other times and was sent to prison four times for charges including robbery and grand larceny, according to the DA and the state Department of Corrections and Community Supervision. His lawyer did not respond to request for comment. ► Two teens were charged with assault after prosecutors said they attacked a man and stole his cellphone inside a Subway sandwich shop on Feb. 19. Naquan Young, 17, Sean Olivers, 19, and three other unapprehended suspects pushed the victim to the ground inside the Subway at 1351 Forest Ave. then punched and kicked him in the head around 5 p.m., according to court papers. The victim's Galaxy Lite cellphone fell out of his pocket during the scuffle. When he tried to retrieve it, Young stepped on his hand and punched him in the face before he took the cellphone and fled, court papers read. Young was arrested Saturday and charged with robbery, assault, petit larceny, criminal possession of stolen property and harassment at his arraignment, the Staten Island District Attorney's office said. His bail was set at $10,000 and he's due back in court on Wednesday. He was arrested in 2013 on charges of robbery and assault and was busted for pot possession in 2014, according to court records. Olivers was arrested Monday and charged with assault and harassment at his arraignment, the Staten Island District Attorney's office said. Olivers was released without bail and is due back in court on Wednesday. Their lawyer could not be reached for comment. ► A man was charged with drunk driving after police clocked him driving 100 miles-per-hour on the West Shore Expressway early Saturday morning, prosecutors said. Police saw Barry Sepulveda, 28, driving his 2006 Acura on the expressway 50 MPH over the speed limit and swerving in and out of lanes without using a turning signal around 1:13 a.m., according to court papers. He later blew a .095 on a breathalyzer test at the station, court papers read. Sepulveda was charged with driving while intoxicated at his arraignment, the Staten Island District Attorney's office said. His bail was set at $2,000 and he's due back in court on March 13, according to online court records. He has multiple prior arrests, officials said, including a drug possession arrest 2009, according to the state's Department of Corrections. His lawyer could not be reached for comment.